When you’ve got a crowd to feed, why not create your own sharing menu? These delicious recipes will encourage everyone to tuck in! 1 Preheat the grill to its highest setting and line a baking tray with tin foil. Slice 2 cloves garlic in half lengthways. Make a deep slit in the side of each aubergine and push two halves of garlic into each one. Place the stuffed aubergines on the baking tray, drizzle with 1 tbsp of the oil and place under the grill. Cook for 20 minutes, turning over halfway through, until soft and lightly scorched on the outside. 2 Leave until cool enough to handle, then place on a chopping board, slice off the stalk and discard. Slice each aubergine open and scoop the soft flesh and garlic onto the board. Discard the skin. Top the aubergine with the tahini, juice from half of the lemon, 2 tbsp of the oil and a generous amount of seasoning. Chop all the ingredients together repeatedly to make a rough paste. Season again to taste, then transfer to a dish and top with a drizzle of olive oil. 3 Place the chick peas in a saucepan, cover with cold water and bring to the boil over a high heat. Simmer for 5 minutes then drain and leave to cool in the sieve. 4 Meanwhile, heat the remaining 3 tbsp olive oil in a large frying pan over a high heat. Add the red onion and stir-fry for 2–3 minutes until starting to soften. Chop the last clove garlic and add to the pan. Fry, stirring occasionally, for 3–4 minutes until the onions have softened. Add the chick peas and carrots, stir to combine, then fry for 1 minute more. Using a potato masher, roughly mash the chick peas until about half are crushed. Remove the pan from the heat and stir through the juice from the remaining lemon and the chopped coriander. Season to taste. 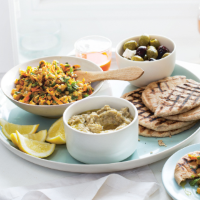 Serve the hash with the aubergine dip, warmed pittas, olives with feta, chilli sauce and lemon wedges. This recipe was first published in Mon Feb 23 14:53:00 GMT 2015.